"An extraordinarily insightful work! This book takes the reader from the symptomatic to the seminal issues in corporate ethics. Ted Malloch brings home to us in no uncertain terms that economic value cannot sustain itself without the foundation of wholesome human values. CEOs, leaders in governments, and heads of educational institutions and the non–profit sector will benefit immensely from reading this work. It is easily one of the best books I have read in a decade." "Malloch takes a stand against the ′world disorder′ of economic vice and short–term thinking that he argues has eroded values on Wall Street, Main Street, and throughout society. A sobering assessment rooted in virtuous principle and a passion for rebuilding trust, reimagining our institutions, and demanding better of ourselves." "The authors of this book understand the crucial distinction between ethics and mere compliance, and convey the decline of ethical values in the workplace in a clear and straightforward manner. This is a very important book for those seeking to get the financial system back on the right track." "The End of Ethics is like a plumb line. It goes straight to the heart of the issue. Highly readable, it pulls no punches in detailing some of the worst cases of recent economic fraud. Then it puts forward sensible solutions that can discourage such widespread abuse of our freedoms. Read it to understand what is wrong with our current form of capitalism and how you can help to set it right." 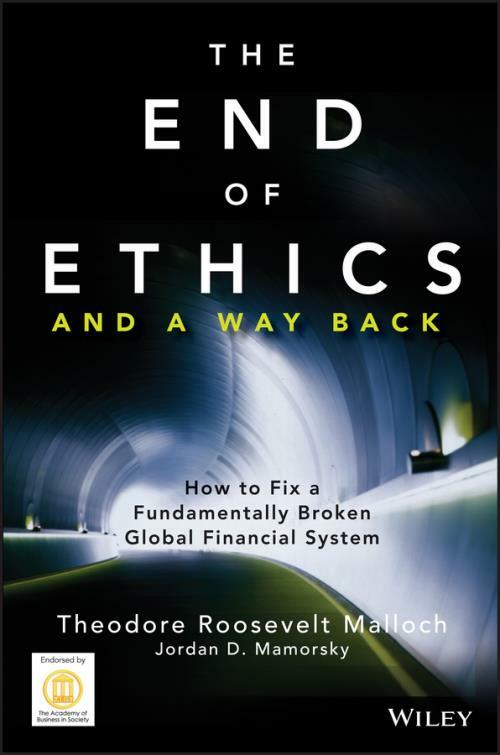 "The End of Ethics provides a fascinating account of the interaction between personal greed, flawed corporate cultures, and a lack of accountability and oversight within the broader financial system. The conclusions it draws are as much an injunction against the tacit acceptance within many corporations that greed is good, as it is a challenge to re–establish capitalism′s moral compass. As such, this book educates and inspires." Theodore Roosevelt Malloch is Research Professor for the Spiritual Capital Initiative at Yale University. He was Chairman and Chief Executive Officer of The Roosevelt Group, a leading strategic management and thought leadership company. He has served on the executive board of the World Economic Forum–Davos; has held an ambassadorial–level position at the United Nations in Geneva, Switzerland; worked in the U.S. State Department and Senate; worked in the capital markets at Salomon Brothers on Wall Street; and has sat on a number of corporate, mutual fund, and not–for–profit boards, including the University of Toronto International Governing Council, a Pew Charitable Trust board, and the Templeton Foundation. Ted earned his PhD in international political economy from the University of Toronto. Jordan D. Mamorsky is an experienced attorney specializing in business regulation, corporate governance, and compliance. He was a postdoctoral fellow at Yale University where his research focused on the legal, financial, and ethical failures that contribute to financial crisis, corporate illegality, and breach of legal fiduciary duties. Jordan formerly worked at the U.S. Treasury Department, where he received the "special act award" in recognition of his recommendations detailing the dangers of predatory subprime lending in low–income communities. He is a contributor to Morningstar Advisor. He is an active practicing attorney and has represented Fortune 500 companies, global investment banks, insurance companies, hedge fund managers, health services corporations and an international sports league, among other clients.